How to measure ECG boxes? How to convert ECG boxes to seconds? 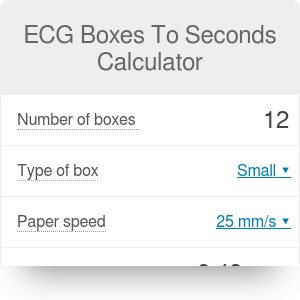 With the help of our ECG boxes to seconds calculator, you will easily convert lengths of intervals or segments in ECG in boxes to their durations in seconds or milliseconds. In the further text, you will learn how to measure ECG boxes with a caliper, how many seconds are represented by one small ECG box and what are the normal ECG values for waves and intervals. After reading, you will also know the diagnostic value of measuring durations of PR interval and QRS complex, and when a first degree block of a heart can be diagnosed. Are you interested in cardiology? Check our cardiac output and stroke volume calculators! The best way to measure the number of ECG boxes between two points on the electrocardiogram is by using a caliper. Place one of measuring tips of your caliper in the first point (e.g., beginning of P wave). Put the other measuring tip of your caliper in the second point. Please keep in mind not to change the position of the first tip. Without changing the angle between the tips, pick the caliper up, and place the first tip at the beginning of any ECG box. Put the other tip in such a way to create a horizontal line between them. Count the number of boxes between the measuring tips. That's it, now you know how to measure ECG boxes, congratulations! A small ECG box measures 1 mm, while a big one has a length of 5 mm. They represent different duration times depending on the speed of paper set in an ECG machine. When the paper speed is set at 25 mm/s, which is a value used in most cases, with each small box on X-axis, 0.04 sec of time passes. The big box, in this case, represents 0.2 sec. With the paper speed of 50 mm/s, we have to divide those values by two. 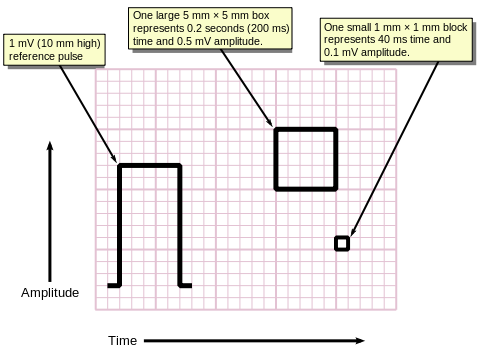 Thus, the small box will “measure” 0.02 sec, and the big box – 0.1 sec. and keep in mind that duration of a box differs depending on its type and the speed of paper set in the ECG machine. Luckily, there is our ECG boxes to seconds calculator, which will do all the dirty work for you! Type in a number of boxes and select other values to best fit the ECG paper you are looking at. It is done! QT interval – should be corrected for a heart rate of a patient. Have you ever wondered what is your maximal healthy heart rate, which you can maintain during physical exercises? Get to know yourself better with our max heart rate calculator. PR interval is a period in the ECG representing the depolarization of atria and the conduction of signal from atria to ventricles (without their depolarization), through the atrioventricular node and the bundle of His – elements of an electrical conduction system of the heart. PR (or as some say PQ) interval is often measured by medical professionals performing ECG because its shortening and prolongation may be a symptom of some pathologies of the heart. PR interval is prolonged in the presence of the first degree block, a malfunction of the electrical conduction system, in which the electrical signal is conducted with a lower speed than usual. To diagnose the first degree block, the PR interval has to be over 200 ms.
One of the causes of shortening of PR interval is the Wolf-Parkinson-White syndrome (WPW syndrome). In this pathology, there is an additional connection between atria and ventricles apart from the atrioventricular node (AV node). In a healthy heart, all the signals from the atria pass through the AV node where they are physiologically slowed down. Because of that, there is enough time between a contraction of atria and a contraction of ventricles, for the latter, to be entirely filled by the blood pumped by the atria. In the WPW syndrome, because of the additional way, omitting the AV node, in which the signal can be transmitted, the depolarization of ventricles may begin earlier. It may also have a different shape in ECG as a result of a different starting point and a direction of depolarization spreading across the cells of ventricles. Typically, in the WPW syndrome, the PR interval lasts less than 120 ms.
To measure PR interval, place one measuring tip of your caliper at the beginning of P wave (a representation of atria depolarization) and the other in a point, in which QRS complex starts. Please note, that QRS complexes may have a Q wave before their R wave and, in such a situation, you have to measure the distance to the beginning of the Q wave. Count the distance in boxes and use our ECG boxes to seconds calculator to get the duration of PR interval. Other durations measured routinely in ECG analysis are the durations of the QRS complex and the QT interval. To learn more about the QT interval, causes of its prolongation and the formula for its correction for a heart rate, see our QTc calculator. You will find there all the answers! Remember also to check our ECG heart rate calculator to get your patient’s heart rate from his ECG. Premature ventricular contraction (PVC) – an ectopic initiation of the depolarization of ventricles from a point inside the ventricles. To measure QRS complex put one of measuring tips of your caliper at the beginning of Q wave (or R wave, when the Q wave is missing) and the other tip at the end of S wave. Continue precisely like in measuring PR interval in the previous section and don't forget to convert the result with our ECG boxes to seconds calculator! ECG Boxes To Seconds Calculator can be embedded on your website to enrich the content you wrote and make it easier for your visitors to understand your message.